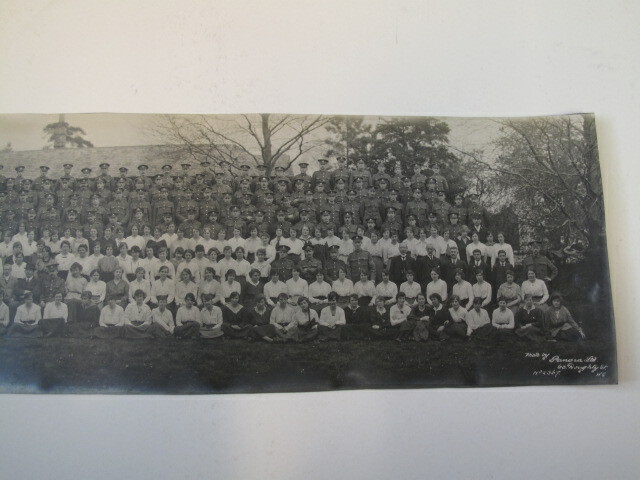 This entry was posted in Archives, Army, Beacon, employment, estates, family history, Lichfield, War, WW1, WW2 and tagged army, Beacon House, Beacon Place, civilians, clerks, employment, history, Lichfield, officers, pay office, War, women by Kate. Bookmark the permalink. I had no idea about any of that. It’s fascinating stuff. I love the description of the celebration for the Coronation, and the reference to glee-singing on Minster Pool – I assumed glee singing was a modern American term, but here we are, in Lichfield, in 1939, doing just that! And did they mean by the side of the pool, or does ‘on’ actually mean that, in which case did they have some kind of boat there, or build a platform out from the bank, over the water? I wonder if the Mercury archives contain any references to the Army Pay Corps during the First World War? When you consider that all over the country men were going off to fight, and women were doing their jobs, it wouldn’t have looked good to have too many Army personnel sitting around in offices. Hi Christine, thanks for the comment. I have done an online search of the newspaper archive and I had a look through the index. So far I haven’t been able to find anything on the pay office itself other than the snippet about the closure of the office, but it’s always worth having another look! The glee singing did make me smile. In Summer 1937, the journal report mentions the gondolas & glee singers on Minster Pool, so it looks as though they may have been singing in boats. Don’t think they would have been singing ‘Don’t Stop Believing’ though! With regard to the men in the office, I understand that after the commencement of the First World War, some of them had been on the front line and had been injured. Dr Black has said in an article he wrote that at least one of the men on the staff photo is missing an arm. I found this information about the pay offices generally on a website called ‘The Wartime Memories Project’. “The vast increase in soldier numbers during the Great War 1914-1918, required an increase in staff strength. By 1918 they numbered 844 Acting Paymasters, 138 lady Superintendents, 11,000 specially enlisted Clerks and 15,000 civilian Clerks”. It’s a fascinating part of Lichfield history, and I think this only really scratches the surface. I wonder if everything in the Mercury would have been archived online, or whether nit would be worth going through the papers for specific years. The Tamworth Herald might not have had a lot, but I would have expected the Lichfield Mercury to have more. When I worked there I used to love looking through the old bound copies of the paper, the earlier the better – but the cellar was a bit spooky. Does the library still have them on microfiche? Yes it does still have it all on microfiche Christine. I am overdue a visit to the records office anyway. Only problem is that I get unvelieveably distracted looking through the newspaper archive. And now there’s a photo of Ian in 1987 to look for too 😉 Better book myself in for the whole week….! Bit of a tangent, but I wouldn’t mind hearing more about the cellar – coincidentally fits in nicely with our Museufy project! It did when I went last year, looking for a picture of me in The Mercury from 1987! Hi Kate, I know this location very well. I remember some of the chaps from the Great War who lived in the City, but I cannot remember any Pay Corps staff. I remember the chaps who survived both world wars paraded proudly on Remembrance Sunday. If I remember correctly there was a TA centre near to Beacon Place after the war, but I think it was disbanded and taken down along with the old Beacon Place buildings in the 60’s to make way for the houses that were built. The City of Lichfield has a long military connection. Incidently, the soldiers use to be based in Lichfield and the old barracks before the one at Whittington. I know the soldiers use to march from Whittington Barracks to the station in Tamworth in full kit to catch the train and then go on to fight in the second world war. Thanks. Its been really hard to find out much about the staff at Beacon PLace. There was a question mark as to whether it actually was there or not but I got a photo from the heritage centre to compare and there was no mistake. 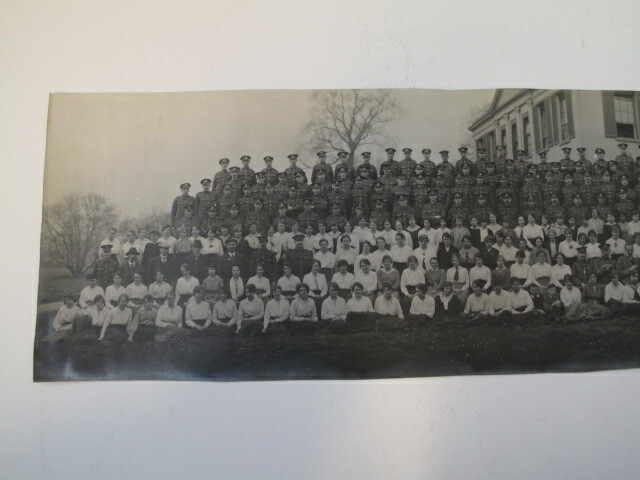 While I was there they showed me a photo of the barracks too – was it on the Birmingham Rd? Apparently there was a POW camp over by Beacon PLace too. Interesting here that the flannels are off to be cleaned. We wash our clothes so often now! There was a big laundry in Lichfield, and a lodge that used to be part of Beacon Place was called Laundry Lodge for a while so I wonder if they sent their flannels to one of these places?! 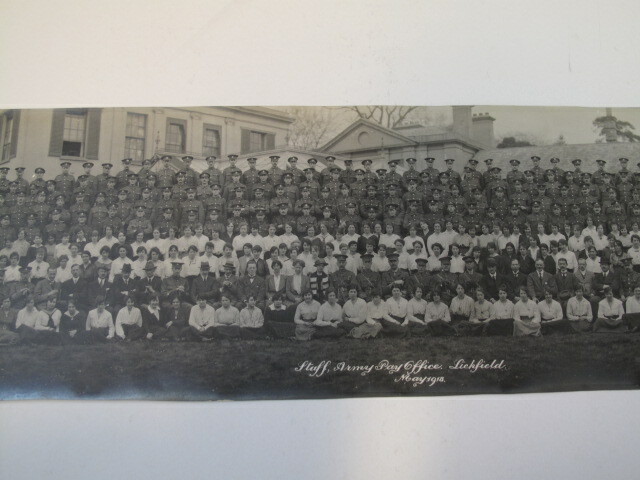 Thank you for this research and providing such an insight into the Army Pay Corps activities in the area, two of my family members worked for the APC in Lichfield from around 1916 – 1920 and may even be somewhere on the picture above! One was a Sargent, in 1916 whilst working for the APC he lived at 25 Trent Valley Road, which from what I have been told was some sort of hospice. The other family member had been serving abroad in 1918 and had been demobilised, I did find a small paragraph about his death in 1920 in the Lichfield Mercury where it mentions that he had been lodging at a house on Lombard Street and working as Clerk for the Army Pay Offices. I would be very interested to learn about the lists of employees you mention above, or any other information that you have come across, I don’t have a great deal of information about the actual establishment there, other than about what was happening with family that worked there at the time. Thanks again for writing this piece! Thanks Ed, it’s something I really ought to revisit. Will keep you posted!